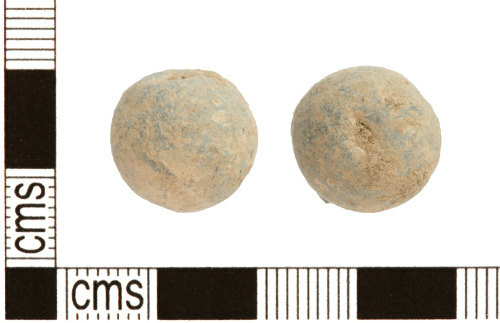 A cast lead alloy shot / ball for use in a Pistol of post medieval date (AD1600-1800). The shot is spherical with a relatively well formed surface patina. The shot is relatively round and smooth - suggesting that it has not been fired. There is a sprue scar with two facets where the casting sprue was probably cut with nippers. The colour of the ball is a pale brown / grey. It shows some signs of damage, probably caused by agricultural machinery. There is some delamination on the surface of the shot. Similar shot have been dated to the later post medieval period however the date range should extend into the early modern period as similar projectiles were used in firearms throughout this period. The context of this find / assemblage would indicate a date in the English civil war. Musket balls are discussed in Courtney's "Small Arms Accessories of the Mid-Seventeenth Century" (1988) and on page 202 of "Material Culture in London in an Age of Transition" by Geoff Egan (2005). This ball / shot was one of over 130 mixed sized shot found on 2 acres of flat and slightly elevated ground, in a field that is around 15 acres.